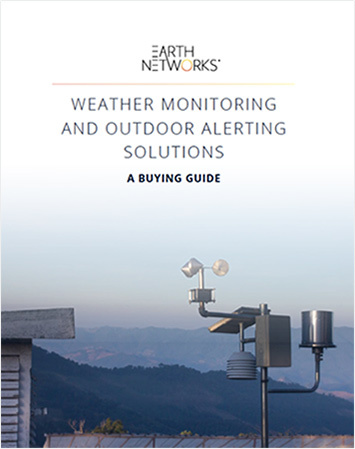 Outdoor facilities now have access to the first commercially available outdoor mass notification system that is fully integrated with in-cloud and cloud-to-ground lightning detection technology. 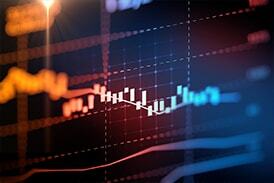 imminent. Since we've had the horn, I have not had that conversation. 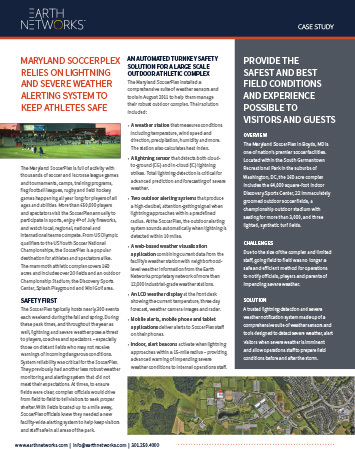 The Maryland SoccerPlex in Boyds, MD is one of nation’s premier soccer facilities. Located within the South Germantown Recreational Park in the suburbs of Washington, DC, the 160 acre complexincludes the 64,000 square-foot indoor Discovery Sports Center, 22 immaculately groomed outdoor soccer fields, a championship outdoor stadium with seating for more than 3,000, and three lighted, synthetic turf fields. Due to the size of the complex and limited staff, going field to field was no longer a safe and efficient method for operations to notify officials, players and parents of impending severe weather. 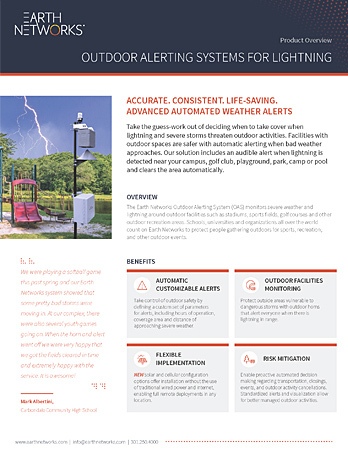 A trusted lightning detection and severe weather notification system made up of a comprehensive suite of weather sensors and tools designed to detect severe weather, alert visitors when severe weather is imminent and allow operations staff to prepare field conditions before and after the storm. When Hurricane Irene threatened the fields just a few weeks after installation, the new horns sounded and alerted visitors of incoming danger. 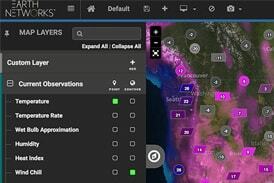 As the storms moved through the area, staff used custom views in their weather visualization tool to monitor approaching lightning and storm cells. 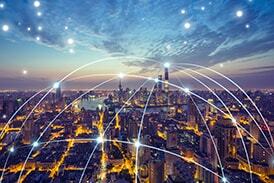 Automatic alerts to mobile devices helped staff clear the area, cancel the games, and keep everyone safe. 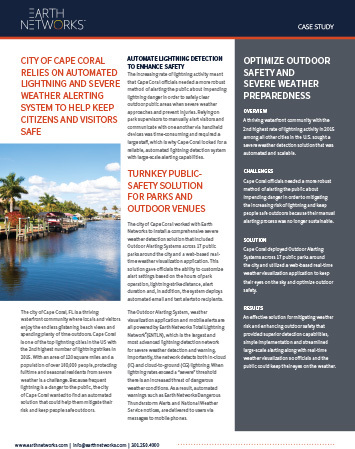 Would you like us to perform a weather safety audit for your organization? 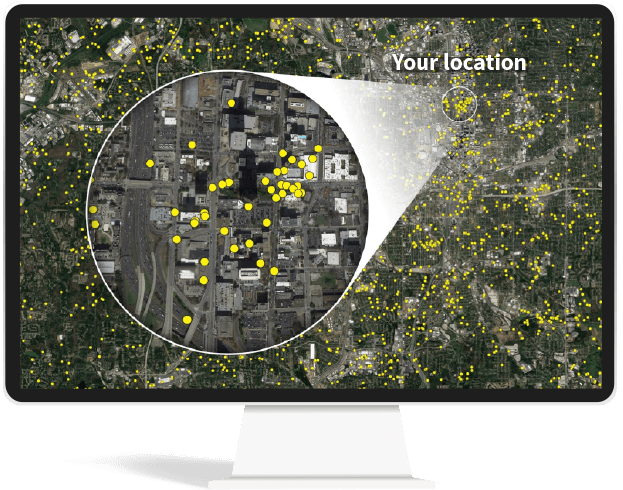 Tell us about your organization and get a free safety audit, including a free lightning risk assessment report customized for your location. 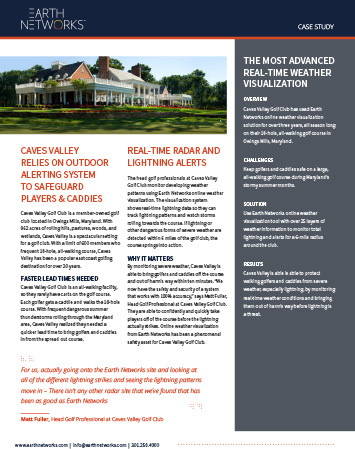 Caves Valley Golf Club has used Earth Networks online weather visualization solution for over three years, all season long on their 18-hole, all-walking golf course in Owings Mills, Maryland. 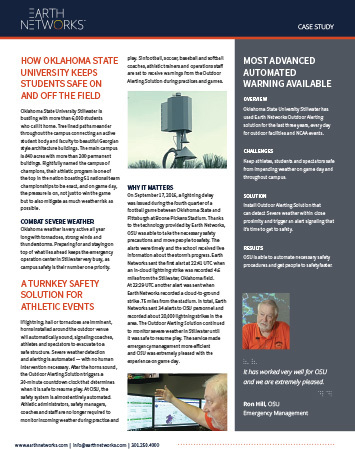 Oklahoma State University Stillwater has used Earth Networks Outdoor Alerting solution for the last three years, every day for outdoor facilities and NCAA events.